The clock started ticking down as wizards from all across the Spiral flooded through the gates of Ravenwood for the second annual Fansite Festival, a celebration for our community, uniting us as one. With the Fansite Festival taking up the entire day of the eighth, I asked around and there was no one hosting a pre-party. I figured it would be a great way to bring the community together and get hyped for this long-awaited celebration so guess who decided to throw together a pre-party at the last minute? That's right! Your friendly neighborhood Thaumaturge. Despite the short notice, we packed two areas and had the party going strong for over four hours! We had a very enjoyable Twitch stream as well and were accompanied on Discord by Chrissy The Blesser, IcyWiz, TechBoyGaming and Jason Summerwielder. You name it? We had it. PvP, mini-games, giveaways and so much more! It was truly a night to remember but alas, the fun had only just begun. Every Wizard in the Spiral had their alarms set this Saturday morning for the action-packed day that was to come. Paige Moonshade brought energy, enthusiasm and smooth dances moves for Wizards to embrace during the first event of the day, the Commons Dance Party. Everybody broke out their Funky and Fresh moves with a line that nearly circled the pond! I enjoyed seeing so many familiar faces and meeting many new ones! It was a pleasure dancing the morning away with all of you and thanks again to Paige for hosting it! If you aren't doing so already, make sure to check out Paige's blog, Paige's Paige and follow her on Twitter for some amazing house decorating and more! Unfortunately I wasn't able to attend every single event but thankfully Ryan, otherwise known as TechBoyGaming, was covering the everything on his stream. Ryan, props to you. It was a long day but you and your team pulled through! They also acted as honorary Merc's for a day where they helped lower-leveled players with dungeons they needed help on. Ryan streams a few times a week and I cannot recommend enough that you guys check out his Twitch, YouTube and Twitter to see some of the amazing content he puts out there for all to enjoy. Speaking of being unable to attend events, I missed out on Secret's of the Spiral and ATSWEL's NXP party! From what I saw on Twitter, it seemed like an amazing time and when it comes around next in Skull Island, I'll be sure to attend. However, I was able to meet up with everyone after this at the Duelist101 PvP Party which needless to say was a blast. They offer so much great insight into the game so make sure to check out their website! Brains were racing and chat was engaging as Vanessa Mythdust hosted The Untold Spiral's Bingo! event through her Twitch stream. She would call out 30 different words which Wizards would match up with the bingo cards they had previously created and submitted. The community ate this event up, I mean who wouldn't? Wizard101 Bingo? Sign me up! Vanessa not only puts out amazing content but she is a great leader within the community. She has some intriguing posts on The Untold Spiral which I would highly recommend you check out while also throwing her a follow on Twitter! Ryan and the Duel Circle team brought unique PvP matches and rule-sets for the community to watch and participate in. Ice vs Ice, Life vs Life, what spells would be cast next? While I didn't get to watch much of the stream, I heard everyone had a blast so make sure to show some love for Duel Circle and check out their website while also connecting with them on Twitter to learn more about how you can participate in their next tournament. And now...... The After Party! What's a party without a celebratory after party? Am I right? While it was a last minute spontaneous thought (similar to the pre-party), I decided and was granted permission to host the official Fansite Festival After Party which despite the (once again) short notice had a pretty decent turn out! We had a night filled with Wildfire Tag and totally unfair PvP matches but that's all part of the fun! We gave out Hoard Packs galore and with that comes a special shout out to Iridian Willowglen who won three games of Wildfire Tag in a row! It was a phenomenal evening, both in-game and on stream and I'm so happy I got to share it with all of you. Being my first Fansite Festival, it truly was one to remember. It reminds me of why I came back to Wizard101, to be with the community that means so much to me and so thank you all for making this yet another spectacular Fansite Festival. Here's to 2018! You didn't honestly think I'd leave you hanging like that, did you? 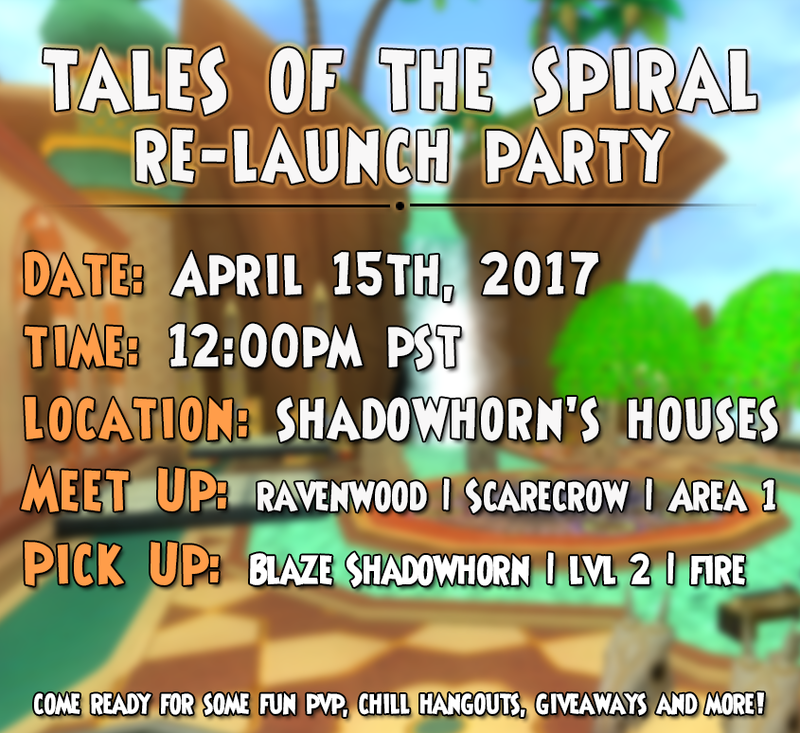 The party continues this coming Saturday, April 15th at 12:00pm PST | 2:00pm CST as I celebrate the Tales of the Spiral re-launch with all of you! We'll have giveaways galore both in-game and on stream, mini-games to fill your hearts content and PvP for those who want. This is one event you won't want to miss out on so make sure to add it to your calendars! Also, we've got the re-launch giveaway currently going on which ends in a few days. I'm giving out a Shinobi Bundle, Wizard101 Gift Cards, hoard packs, mounts and so much more! I know you want to enter, who wouldn't so come get your entries in before it's too late! Enter now. Thank you all once again for making this an amazing Fansite Festival! Comment on this post letting me know what your favorite part of the Fansite Festival was and why. I'd be curious to find out!